Mobile Shredding 10 boxes just $99. All 5 Star Yelp reviews.Watch us Shred for you. We are a mobile shredder, meaning we come to you. We will shred at your home or office. We are affordable and upfront with our pricing. 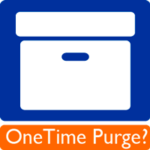 We offer Purge/one time mobile shredding. We also offer businesses Monthly/scheduled mobile shredding. We are local owner operated…not a chain or franchise. We comply with all state and federal privacy laws including HIPAA & FACTA. We love the environment and ALL of your shredded paper is recycled. Even if you have a simple question we would love to hear from you. We will will not waste your time with a cheesy sales pitch or try to scare you into choosing Shred Bull®. We will be upfront and honest. Shred Bull® mobile shredding will do a great job for you. We are in this for the long run and work hard to earn your repeat business. Our mobile shredding truck comes to your home, office or storage facility and shreds everything at your location. We are a mobile shredding company, meaning we are driving all over Orange County every day. 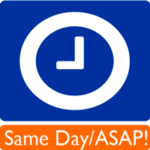 We are happy to schedule a stop at your storage unit, home, office or wherever. Your calls and requests are encouraged, after all we are here to serve you. We service accounts in the field Monday-Saturday 7:00AM- 7:00PM and Sunday answer calls 7AM-7PM. If we are shredding in the field it can get loud, so you may get voicemail. We will call you right back…please leave a message, we want your business. We have drop off shredding locations in Orange County, California. Click here for Drop-Off locations. If you have an emergency shredding situation(moving etc), call us even on Sunday and we’ll see what we can do. Want to read what our clients think? We highly recommend Shred Bull for professionalism and great service. I enthusiastically recommend John and Shred Bull. I highly recommend you to my friends and colleagues. 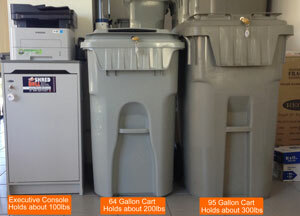 We feature three types of document collection containers for our monthly/scheduled business customers. You can choose how many, what kind, and where they get placed. We then just charge you when we come by to empty them -usually once per month. Click here to read more about our regularly scheduled shredding service for orange county businesses. If you are looking for a shredding company that is super responsive look no further. Shred Bull® answers service calls(or texts or emails) 7 days a week. We know when you have full shredding containers you want them emptied ASAP, so we can normally come out the same day and empty them for you(without charging you extra fees). Need more containers? 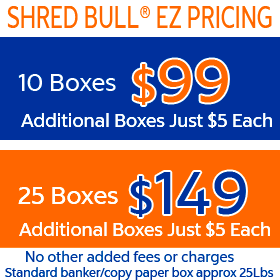 Shred Bull® stocks all sizes so we can get you a new one in a jiffy. Our staff is professional(looking & acting) as we understand you have a business to run. When you hire Shred Bull® mobile shredding you can trust that the job will get done correctly, every time. We promise you great service, at a great price.